Radishes (Botanical name- Raphanus sativus) are very easy to grow. The entire radish plant is edible, root, leaves, flowers and even seed pods. Radishes can be grown in or in containersgarden beds, outdoors or indoors. Learn how to grow radishes in containers or garden beds, outdoors or indoors, with details on how deep to sow the seeds. Radishes are a fast-growing cool-season annual crop. The seeds germinate quickly and the smaller varieties can be harvested for consumption within a month, while larger daikon varieties takes several months from seed sowing. Radishes come in various varieties, depending on size, color, flavour and the length of of their maturity. Smaller roots variety produces small roots - white or red, 1 inch diameter round or 3 inch long, with only a few leaves about 5 in long. Longer root variety produces up to 24 inch long roots, with leaves about 24 inch long. This type includes oriental radishes, daikon, mooli and winter radishes. Radishes grow well in full sun, at least 6 hours of direct sunlight. In shade, the radish plants produce larger leaves with small roots. Radishes are a cool weather crop. In warm weather they bolt more quickly and put most of the growth into the tops. Radishes can be grown in containers and ground as well. If growing in pots, take a deep pot, more than 12 inch for long radishes and 6 inch deep for round radishes, with several drainage holes at the bottom. A 2 ft diameter pot can grow about 20 radishes. Radishes require well-drained rich soil with pH 5.8 to 7.2. Dig the ground to a depth of 12 inch and remove any rocks and pebbles, break big chunks of soil. If the soil is clay, mix some river sand to make it free draining. Mix some organic material like compost (composting) and aged manure and sprinkle some 4-5-0 (N-P-K) fertilizer. If the soil is too acidic, it will cause only the leaves to grow. If this is the case for your radish crop, then next year get the soil tested for its pH level and then amend it to make it neutral. 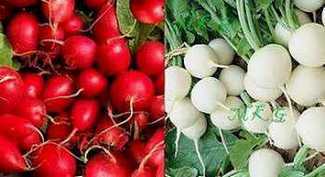 Radishes are cold season vegetable and can be planted in spring and the autumn. Plant about 4 weeks before the average date of last frost in spring. In Australia, USA and elsewhere, it can be planted when the soil temperature is between 8 to 30°C. In USA, radishes can be grown in USDA Hardiness Zones: 2, 3, 4, 5, 6, 7, 8, 9, 10. Radishes can be planted every 2-3 weeks to take many crips each season due to its rapid days to maturity. Radish is propagated directly from seed. Planting direct seeds in the garden is the easiest way to grow radishes. Do not sow the seeds very deep. Sow at a depth of atl east three times the size of seed, but not more than half inch deep and 3-4 inch apart in rows 12 inches apart. The spacing of the plant depends on the seed variety, check the seed packet for recommendations to ensure that there is enough room for the roots to grow. Water well and keep moist. The seeds will germinate in 3-4 days. When the seedlings are about 2 inches high, thin them to keep 1 to 2 inch distance between them for spring and summer type plants and 2 to 4 inches for winter types. If you want continuous harvest of radishes, sow seeds every two weeks. Mulch with any organic mulch to contain moisture and discourage weeds. Cut the tip of a radish which contains a tiny root and burry it in ground. Keep the soil moist. The new radish plant will emerge in a few days. Plant a small radish in the ground and water. Continue watering daily, the radish will grow to full size. Water well to maintain plenty of moisture, but not waterlogged. Water consistently, uneven watering will slow cause radishes to split and becoming bitter. Hot and dry weather can also cause the radish roots to become spicy and woody. Always water in the morning. If the leaves turn yellow, it means you are watering too much. If planting in a container and indoors, place the pot near a window where it can get sunlight. Why Very Small Radish or No Root Development? The soil is not loose. Mix river sand to the soil. Too much nitrogen and too little potassium in soil. Give seaweed or copmfrey liquid fertilizer every 3rd week. Aphids, Cabbage maggot, Flea beetles, can cause leaf curl, wilted leaves, yellow leaves, and small, round holes in leaves. Root maggots may tunnel into radish roota. Use row covers at planting. Rotate to different part of garden at next seeding. Bacteria scab can cause crown-yellow circular lesions on roots; sunken, cracked lesions which may be irregular in shape and coalesce. It is difficult to control. You should maintain soil moisture high, also keep the soil pH low. Rotating crop is a good solution to scab attack. Treat the plant with an insecticide. Spray diatomaceous earth (DE) on leaves. It is a white talc-like powder that is the fossilized remains of marine phytoplankton. Radishes don't require additional fertilization if soil containsaged manure and compost. Radishes require 22 to 70 days to come to harvest from sowing seed. Radishes require 3-8 weeks after planting depending on varieties. Do not leave in the ground long after maturity, they will become hard, fibrous and spicy. If left in the garden, spring and summer types will often begin to flower. When roots are about 1 inch in diameter and young, they are tasty to eat. Slow growing radishes will become hard. So maintain good soil moisture and fertility to encourage fast growth. Tender leaves of radishes can be eaten as salad and in making a vegie. I normally pinch half of the tender leaves from each plant and use them. Such plants take a bit longer to full root development. Do not take out the radish roots and let them form seed stalks with pods. Pinch ioff the pods. You can plant the tops from radishes purchased at the shop. After they form roots, they will flower and produce many seed pods. Radish seed pods can be eaten as a salad. In India, these pods are used in cooking to make a veggie. The plants which can be planted in the same garden bed with radishes are cress, leeks, lettuce, spinach, strawberries and tomatoes. Do not take out the radish root and let it form a seed stalk with pods. Leave the pods dry on the plant to dry. Once the pods are fully dry and brown, break open the pods and collect the seeds. Store seeds in a container in a cool, dark, dry place for up to 4-5 years. Anderson, C. R. Radishes. University of Arkansas, Division of Agriculture, Home gardening Series: radishes, www.uaex.edu/publications/pdf/FSA-6075.pdf.